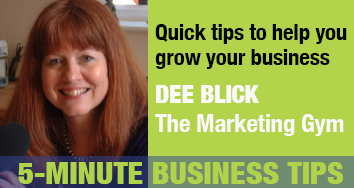 Our Quick Tips are designed to help you build your business skills, a few minutes at a time. If you want to know more about the same subject – and have more time to spare – you can listen to the 15-minute masterclass on the same topic. If you have the time available, you may like to listen to Dee talk in more depth about this subject in the 15-minute Masterclass: The importance of your positioning statement. Hi, it’s Dee and I’m delighted to be back here again and today, I’m talking about the importance of you developing a positioning statement, otherwise known as a benefit statement. It’s a question that can strike terror into the heart of any business owner: “Why should I do business with you?” There are two ways to answer this and I’m going to give you two great case studies, one of the ‘bad’ business that doesn’t get the answer right and of the ‘good’ business, that gets the answer absolutely spot on, because they’ve actually developed a cracking benefit statement, so they’re not floundering for what to say. Let’s look at the ‘bad’ business. What kind of response would they give to that question,“Why should I do business with you?” They may trot out the things that lot of business trot out, that don’t really make them stand out from any other business on the market: “We’re the best. We do this. We do that. We do the other.” In other words, they trot out a shopping list of what they offer. They might even use hackneyed phrases. “You tried the rest, now try the best.” They might even say they’ve got a ‘unique selling point’, when in fact, they haven’t. I tell you, saying that you offer great service, ain’t no unique selling point. There are millions of fabulous, small businesses that do that. They may even blank on what to say. Why are they doing this? Why are they blanking on what to say? Because, they haven’t really thought about the benefits that they bring to the people that they want to do business with. Something else about the ‘bad’ business, that’s pretty woeful as well, is when they’re communicating all that’s good and great about their business in the written word. You look at their sales letters. You look at their flyers. You hop onto their website and what you get is boring. There’s either loads of white space, not because they’re particularly artily inclined and they love white space, it’s because they don’t know what to say about their business. What makes them so fantastic? They’re struggling. Worse still, what else have they done? They’ve given the job of writing about their business, this absolutely fantastic business that they burned many hours of midnight oil over, they were so passionate about, and they’ve given the job of writing about why they’re so brilliant, about all the benefits that they offer, to somebody that may be a copywriter, that’s never really got to know them, or even to an office junior, even to their mum, anybody, but not themselves. They’ve almost abdicated the responsibility of shouting out from the rooftops about their greatness. In other words, they haven’t developed a benefits statement. That ‘bad’ business may have jotted a few things down, but they’re a bit prehistoric. What they’re doing is, they’re hanging onto the benefits that they offered yonks ago, rather than bringing it up to date. Let’s now look at the ‘good’ business. The ‘good’ business that when somebody says, “Why should I do business with you?” they are positively brimming with fantastic, juicy benefits about what they offer to the people they want to do business with. What have they done? First of all, they took a little bit of time to sit down and think about – what are the benefits that I offer? Now, they’ve hit a bit of a base point of this, which is their own thoughts about what makes them so good, but they realise that ultimately, it’s how their clients judge them and what they think about what they offer that’s going to have more weight than anything they could possibly say. They’ve talked to their clients and said, “Why do you do business with us? What do you think we do that makes us stand out? What have we delivered for you that’s been particularly exceptional?” They’ve hopped onto the internet. They’ve researched a few competitors and, without a shred of ego, they found out what they are doing that’s perhaps better than their competitors. They’ve actually thought about their story: “Why did I develop my business? It wasn’t just to make money. I had a burning desire to help people, to make a difference, to do some good, and perhaps if I included my story in my benefits statement. I’ve got something quite powerful there,” because we all love a good story, don’t we? What these businesses do, these ‘good’ businesses, they gather all this information in from clients, from their competitor research, from what they know about what they deliver and they put it into a little document that’s called their benefits statement, and do you know what? This is the anchor to your business. It’s this pivotal little document that when you’re next updating your website, you’re not floundering around for what to say. You’ve got some real nuggets of information, there. You’ve got some great customer testimonials. When you go to create an advert, you don’t just see a sea of white space and just fill it with a shopping list of what you offer. Again, you’ve got some cracking benefits, so I can’t stress enough to you, the importance of creating this little positioning statement because if you don’t, you’re effectively selling your business short. You’re taking it out into that marketplace and you’re just saying, “Here’s a shopping list of what I do. Take your pick. What’s your fancy?” Customers need to feel that they’ve got a great reason, better still, two reasons, three, four reasons, for doing business with you. If you’re not showing them this fabulous market store of all your gorgeously polished bits of fruit … If you’re not really getting out there and shouting that message out loud and clear, you’re not actually doing your business any justice. You deserve more than that. I really hope that you’ve found this little session useful. Thank you.